About Nouns and Verbs Have a Field Day: Mr. Wright's class is enjoying a Field Day outside, and the nouns and verbs don't want to miss out on the fun so they create their own field day. After dividing up on teams, the nouns and verbs soon realize that they must work together to get anything done. Then, when students return to the class, they find a crazy letter that teaches them this lesson as well! The concept is unquestionably quite silly, but students will definitely "realize that sentences need both nouns and verbs in order to make sense." (Booklist) The brightly colored, super energetic illustrations sure do add a lot of fun! We agree with School Library Journal, who said: "just like the energetic verbs that strut across the pages, this book is where the action is." Be sure to read all the speech bubbles by the little noun and verb characters, as they are full of their respective words (nouns saying nouns, verbs saying verbs). 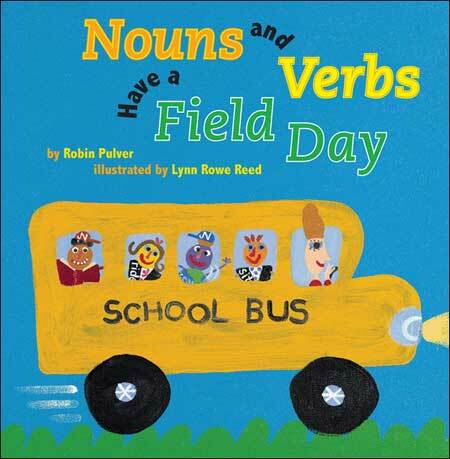 Below are sample spreads from inside Nouns and Verbs Have a Field Day. While all the pages are this vividly colored and 'high energy', most pages are more chaotic/full than this one and have about double the text. 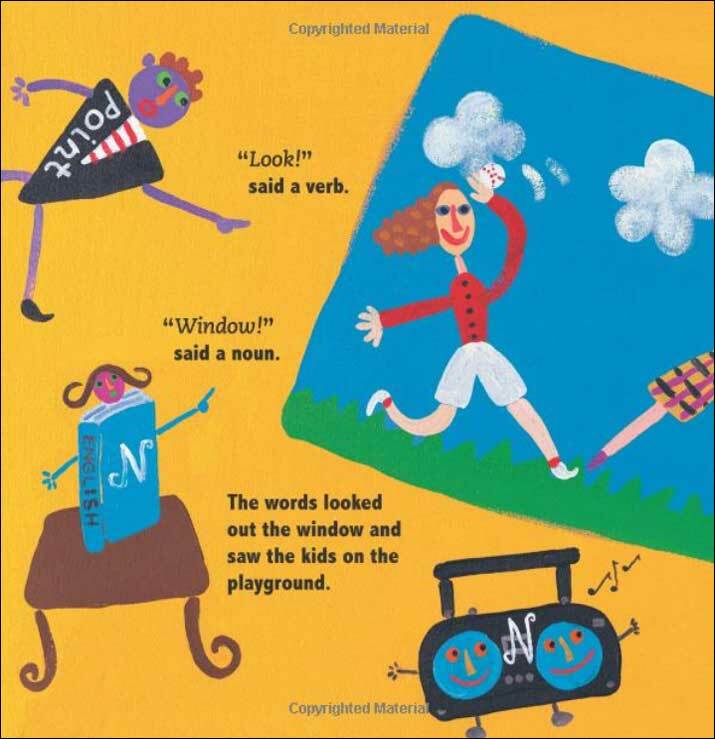 In the first spread (which is also the first spread in the book), the students are shown searching the room for nouns and verbs. 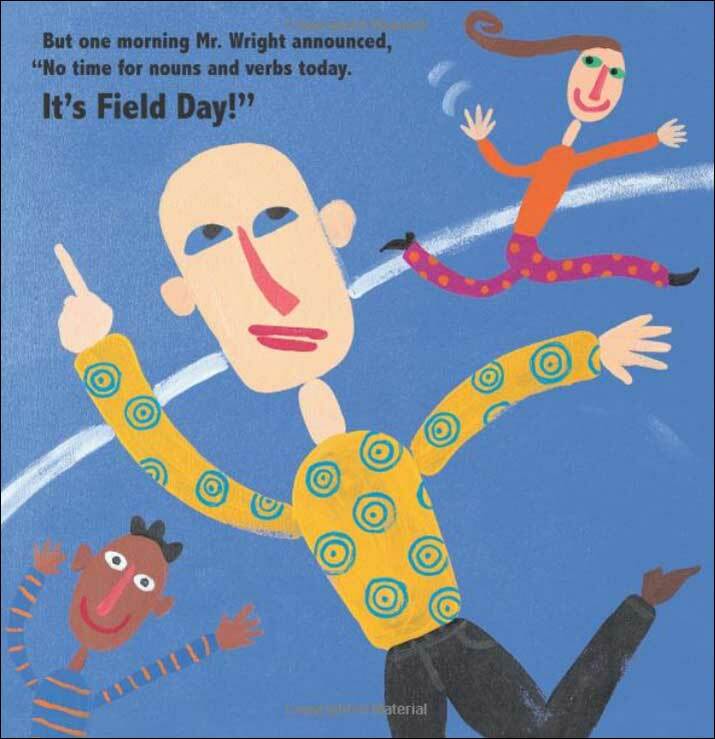 In the second spread shown here, Mr. Wright announces that it's Field Day and the kids head outside. 1. 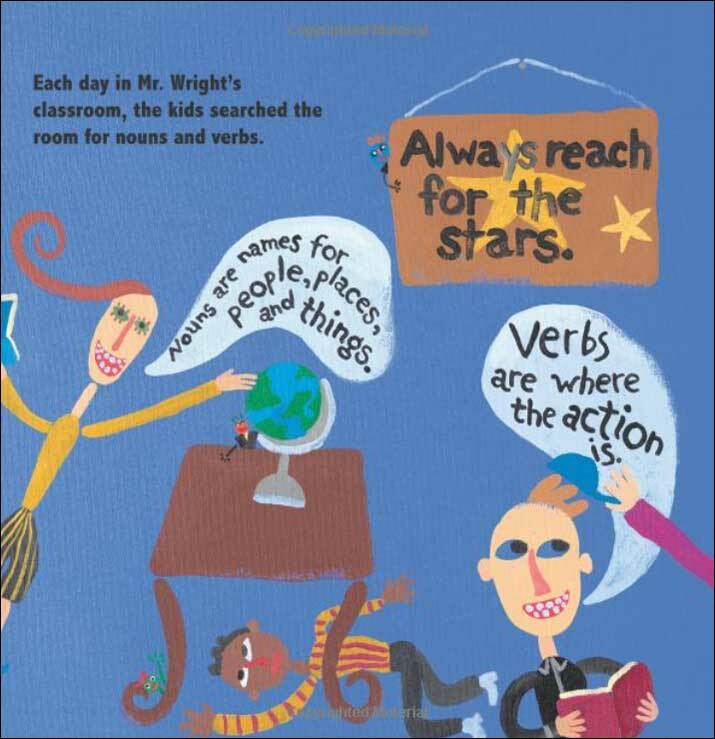 Make a list of five nouns and five verbs in your own classroom. 2. In this story, why were the nouns and verbs left alone? 3. 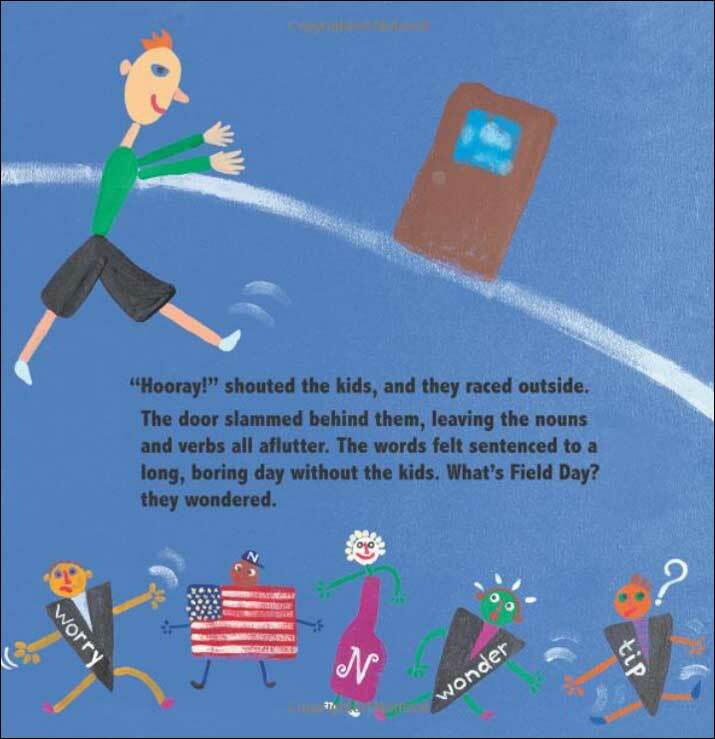 Describe field day at your school. If you don't have one, imagine one. 4. At first, how did the words pair up? Why didn't that work? 5. How did they realize their mistake? Then what did they do? 6. Which team had capitalized letters? Why? Find three in your classroom. 7. Explain the difference between a strong and a weak verb. How can you tell? 8. 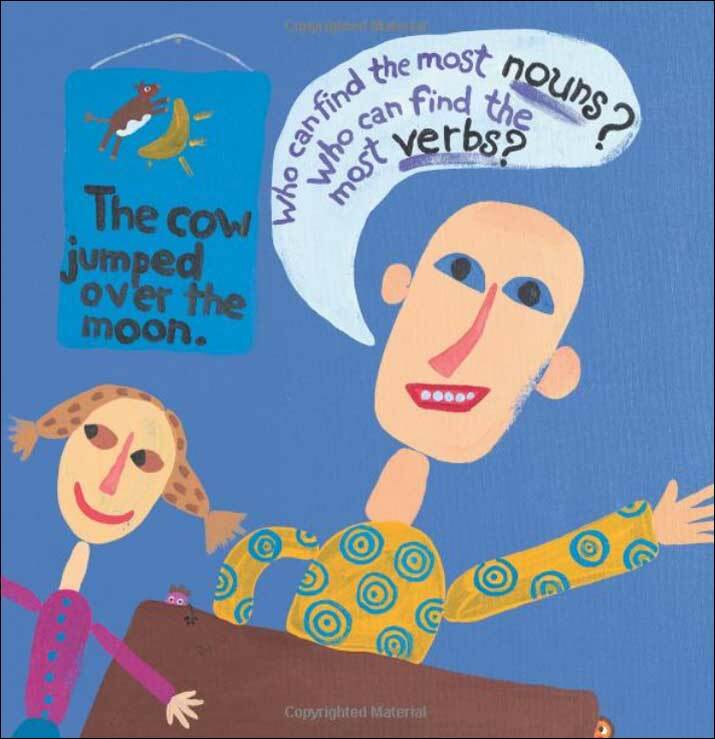 Which nouns were hiding from which verbs? Why? 9. What's wrong in the classroom when the kids return? 10. Who had more fun-the words, or the kids? What makes you think so?" We love all books by Robin Pulver! 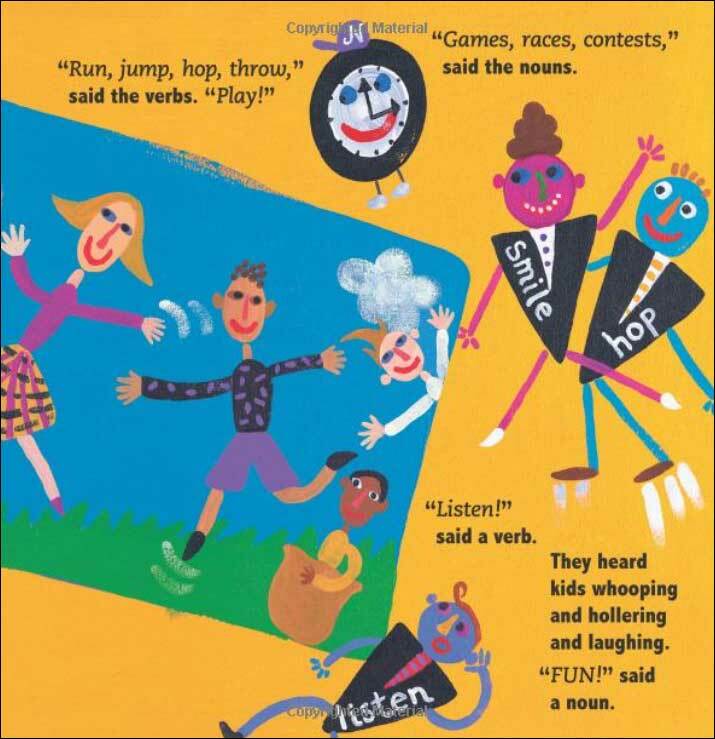 They are each focused on different phonics/ language arts topics, but the message is always silly and kid-friendly rather than laborious or boring. To learn more about her cute books, click on the book covers below or the link above.